One of the constraints that I see emerging from trajectory of the digital environment (a change in the conditions of change) is a profound transformation in our narrative of the individual self. The shift is from the ubiquitous narrative of individuals as atomistic, isolated and selfish – toward a narrative that illuminates the individual as a ‘Social Self’ – as a deeply interdependent being. Enactive interfaces are interactive systems that allow organization and transmission of knowledge obtained through action. Enactive knowledge is information gained through perception–action interaction in the environment. In many aspects the enactive knowledge is more natural than the other forms both in terms of the learning process and in the way it is applied in the world. Such knowledge is inherently multimodal because it requires the co-ordination of the various senses. Two key characteristics of enactive knowledge are that it is experiential: it relates to doing and depends on the user's experience, and it is cultural: the way of doing is itself dependent upon social aspects, attitudes, values, practices, and legacy. Probably my first pre-understandings that helped me grasp the concept of enaction begins with Gregory Bateson’s observation that the ‘unit of survival’ is not the individual, rather it is species. Even more, that the unit of survival is in fact – the species-in-environment. As an example Bateson suggests that as horses eat grass, grass & environment is pressured to change and thus evolves – which in turn shapes the horse’s eating practice – which in turn shapes-changes the grass-environment, and on and on. This is the way nature and evolution work (let’s not talk about horizontal gene transfer now - even though it is a vital and pervasive medium of evolution). 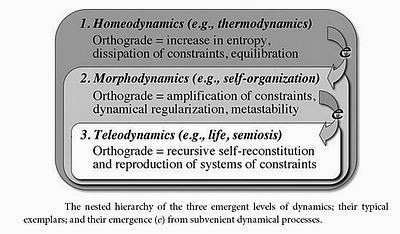 In this way we can see that in evolving living systems – the process of living creates conditions of dynamic change in themselves in-their-environment. Thus, humans-as-nature are the products and producers of their environment. We are co-creators as a species-in-environment-mutualism. 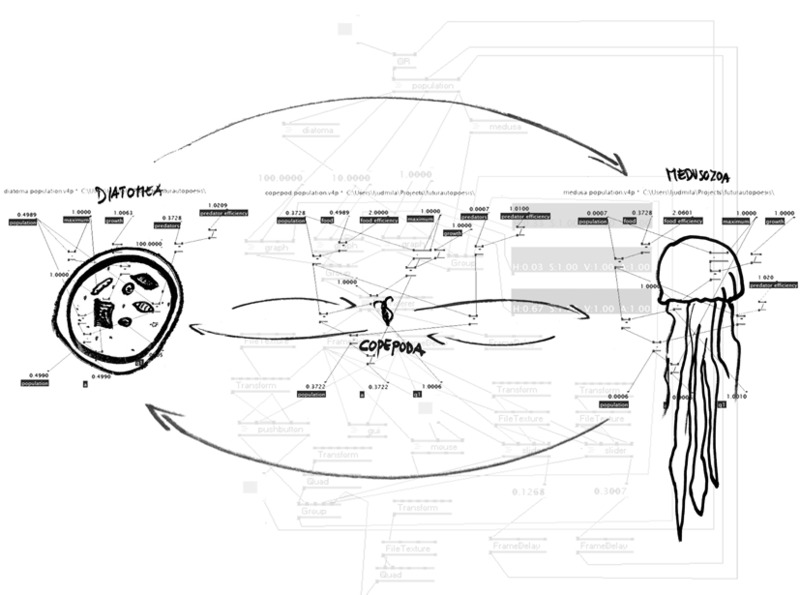 The next lineage of thinking began with my encounter with the theory of Autopoiesis. As the theory of ‘Autopoiesis’ suggests, (e.g. see Varela, Thompson and Rosch 1992, Thompson 2010, among other works) cognition is not a representation of a pre-given world – rather it is a co-organization of experience/practice of embodied-beings-in-environment. Essentially this means that living systems organize a world. But there’s more to this. At least the way I’ve come to understand the implications of our deeply social (co-created/interdependent) nature (not just a human sociality – but that too). We seem to be ensnared in many epistemological pathologies (Bateson’s term) – one of which is that ‘technology’ is something outside of life – rather than the deep embodiment of life itself (also see Kevin Kelly’s ‘What Technology Wants’). For example – birds build nests, ants farm aphids to harvest the mold that grows on them, evolution embodies selection ‘mechanisms’, etc. If we accept that technology is implicated in our enaction of the world – then we can understand that the invention of the technologies of culture and language are also the creation of externalizable systems of memory that enable new forms of learnings. These new forms of learning no longer require that they be encoded in DNA and experienced as ‘instinct’ – instead learnings are enabled to be encoded in Memes that can be exchanged, discarded, improved many time within a single lifetime. 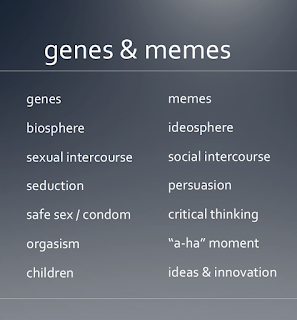 Thus, with the invention the technologies of language and culture, humans became even more deeply social as well as self-programmable – by encoding learnings in meme as well as genes the diversity and adaptability of learning accelerated exponentially – a trajectory we are still on. 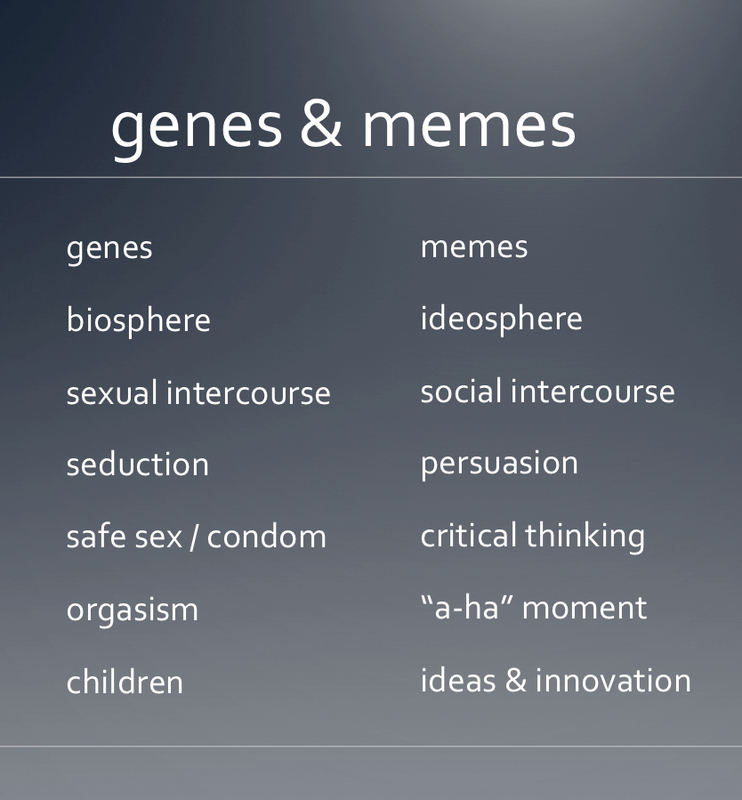 The advantage of meme for the human was that memes enabled groups of humans to adapt more rapidly to an environment also undergoing rapid and tremendous climate change (e.g. ice ages). It could be argued that the pressures of early climate change are also implicated in the change in the conditions of change, shaping the evolution of homo sapiens. In this way it can be further argued that the change in conditions of change enabled the emergence of a new form of social-technological-enaction-of-human-in-environment. Another concept that continues to provide me with insight is the concept of ‘formal cause’. Not only is it an interesting addition to understanding causality but I believe it also enables us to appreciate the more profound implications of enaction. Manuel Delanda gives a nice metaphor for understanding ‘formal cause’ when he describes what an ‘attractor’ is, by using the metaphor of blowing soap bubbles. No matter what the shape of the bubble wand is, or when a bubble is blown, it always seeks to become a perfect orb. However, neither the trajectory to nor the final perfect orb can be found in the shape of the bubble wand, or in the breath used to blow the bubble, or in the soap solution or even in the soap film (although surface tension is important). The perfect orb that seems to be the goal of the soap bubble is, in retrospect, an attractor of a computation by soap bubble to find the shape with the minimum surface tension possible. The ultimate nature of an attractor is not possible to see before it is manifest –as Marshall McLuhan (2011 – Media and Formal Cause) points out – we first see the effects before we see the (formal) cause. 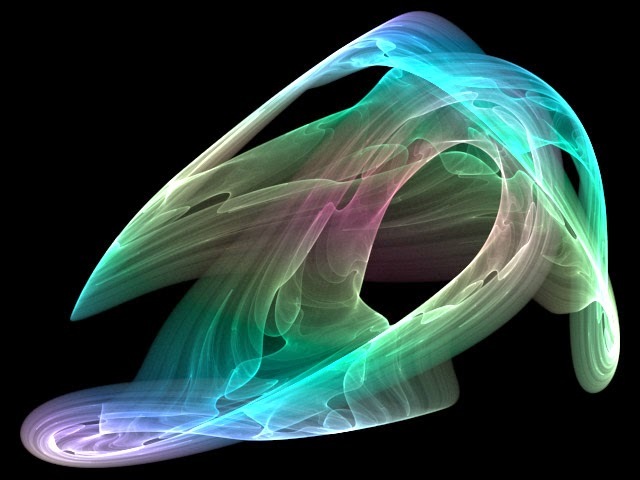 By understanding the concept of attractor – I finally was able to get a grasp on the nature of formal cause. As Hegel noted – the truth is in the whole. But how is enaction and formal-cause-as-attractor related? Before I answer this, there is another important and related concept that can help us to grasp the inherent mutualism of living systems, as a type of ground of/for sociality. Terrance Deacon in his book “Incomplete Nature” coined the term ‘Entention’. This concept/term is meant to recall the term intention – but with a much broader scope of ‘enaction’. As an adjective ‘ententional’ applies to any object or phenomena that is essentially explicitly about something that is not physically present. For example books are ententional because a book is explicitly referential to both readers and literacy that aren’t actually present in a book by itself. DNA is also ententional in that DNA strands refer to ‘living systems and ecologies’ that aren’t themselves physically present in the DNA strand(s). Tools are ententional in referring to tool makers/users and purposes not explicitly present. Stuart Kaufman indirectly points to the idea of ententionality, when he makes the distinction that there is no ‘purpose’ in objects obeying the laws of physics but that purpose or function emerges only in living systems. For example there is no function or purpose in a ball rolling down an incline as it responds to gravitational forces. But there is a purpose-function to the beating of a heart (Deacon elaborate the emergence of purpose in much greater detail in his book). 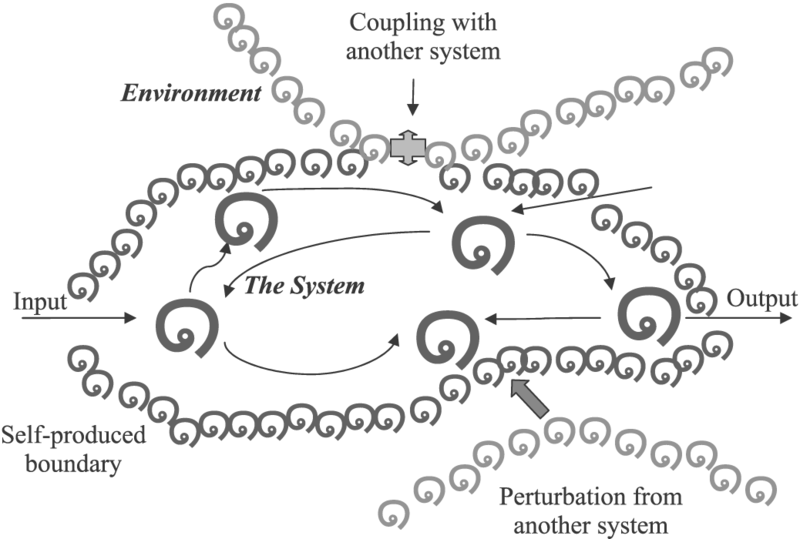 So enaction points to a part-whole co-structuring, co-constructuring, co-evolving mutualisms. This is where the concept of Formal Cause shifts our framing of causality with a perspective that tries to grasp the whole. Rather than only relying on the sort of cascading dominoes represented by ‘efficient causation’ we are enabled to look at the conditions of change and therefore a change in the conditions of change – that implicate the whole-and-its-parts simultaneously. But enaction also entails a more profound realization of how we know and are. That the meanings and learnings of our experience can only arise as we comprehend our ententionality (purposes not present but imbued in the whole). Ententionality is a profound dimension of the context of our enactive living experience as individual-in-species-environments. However, as humans our environments include new technological emergences of language and culture. Language occurs as a flow of living together in recursive coordination’s of behaviors, that is, recursive coordination’s of feelings, emotions, and doings. …as languaging beings we live in networks of conversations. We speak of conversations when we attend to the inner feelings and emotions that guide our recursive coordination’s of behaviors. It could very well be that at least some of what we experience as emergence is a first glimpsing of an enactive affordance. 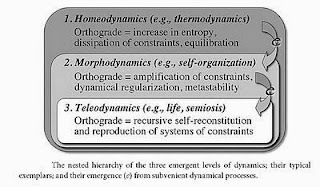 We grasp such emergences as the effects of the formal causes that constitute the co-shaping of the ententions inherent in our evolutionary holisms of species-ecologies-environments in a more than finite world. A world that is more than finite because it is also open to a continual influx of energy. The influx of energy is at once the condition for life and simultaneously the affordances that life has learned (and continues learning) to transform into ever greater variety of matter-energy-mind enactive instantiations. Enaction is the effect of formal cause arising from the whole-of-system-in-environment. Given this line of reasoning and this formulation of human arising – the idea that humans are outside of nature or that individuals can ‘enact’ an isolated, atomistic way of being is both impossible and ludicrous. 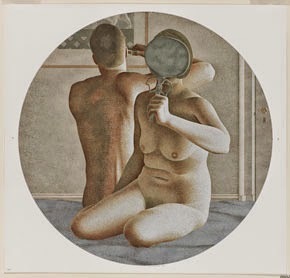 The most interesting paradox that arises from a narrative of an enacted, ententional social self – is that individuality as an ever blossoming process of individuation can only arise in a context of an ever growing network of encounters. These encounters include people we don’t know (moments where it is possible to explore new behavior – and have our mirror-neurons respond to new people) or new types of interaction with people we already know, or engaging in liminal situations. Thus the more connected one becomes – the more possibilities to individuate there are. The social self is the self that evolves – unlike the isolated, atomistic and permanent self-identity. This paradox of individuation through social interaction is also scary – it means being ready to face many uncertainties including engaging in liminal situations and the encounters these situation involve. The next post will build on this and previous posts to explore a bit more deeply how debt is social fabric. Debt as favors, obligations, responsibilities, form the fundamental nature of the social fabric through which we enact ourselves-through-others. Understanding the nature of debt-as-social-fabric provides an interesting ground to imagine the possible constraints that the digital environment enables and demands. Constraints that are necessary to harness human efforts to do the work of sustaining social fabric by revealing our ubiquitous and eternal debts, our enactions of value, our creative efforts, and our moments of trust and risk. Constraints that enable the revealing of value where ever it is created will also shape new constructions of social identity and social self. Francisco J. Varela, Eleanor Rosch, Evan Thompson. 1992. The Embodied Mind: Cognitive Science and Human Experience. MIT Press. Evan Thompson. 2010. Mind in Life: Biology, Phenomenology, and the Sciences of Mind. Belknap Press. Deacon, Terrance, W. 2011. 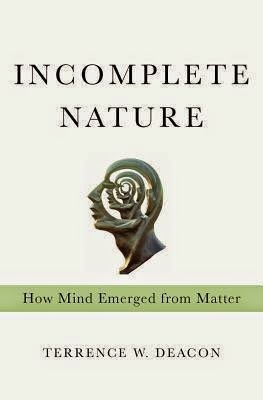 Incomplete Nature: How Mind Emerged From Matter. WW Norton.